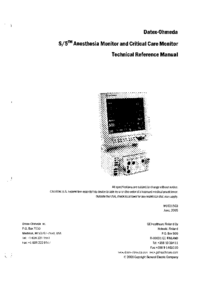 The Model 7000 Anesthesia Ventilator is an electronically controlled, pneumatically driven device, specifically designed for mechanical ventilation of patients during surgery under general anesthesia. The instrument consists of two major parts: 1. The Bellows Assembly* connects to both the control unit and anesthesia machine by flexible hoses, and isolates the breathing circle system from the driving gas. Provision is made for mounting the bellows assembly on top of the control unit. Note: A Kit, (Stock No. 0219-7518-810) is available to be used with the Modulus II Anesthesia System which permits the GMS Absorber to 7000 Ventilator bellows interface. 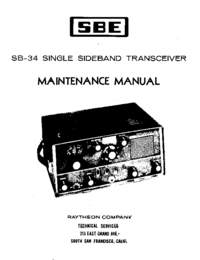 Installation instructions are provided with the kit. 2. The Control Unit contains all the electrical and pneumatic components necessary to drive the bellows assembly according to the selected parameters, and to perform the monitoring alarm functions. The controls on the Ventilator are calibrated to linear scales, and are non-interactive so that changing one control setting does not affect the other control settings. They are set to the physiological parameters of Minute Volume, Breathing Rate, and Inspiratory/Expiratory ratio. From these settings, the electronic circuitry in the Ventilator calculates the Flow and Tidal Volume to deliver to the patient. Several alarm conditions are monitored by the electronic circuitry: 1. Low Oxygen Supply Pressure 2. Low Airway Pressure 3. High Airway Pressure 4. Ventilator Failure (electronics) 5. Selected Minute Volume not delivered 6. Actual I:E ratio less than dial setting The Ventilator operates from a nominal 50 psig oxygen source, usually delivered from the power outlet of an anesthesia gas machine. The driving gas consumption is approximately the same as the minute volume delivered. 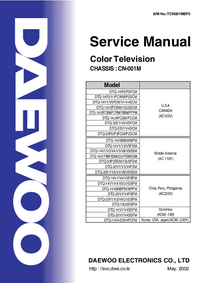 This service manual covers the variation of the 7000 Electronic Ventilator which has selectable mains voltages. 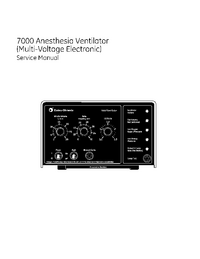 Earlier variations of the 7000 Electronic Ventilator are covered in the 7000 Electronic Ventilator Service Manual Stock Number 0178-0125-000.